From the outside, the doors to this 17th century palace look worn and nondescript, easy to miss to the unsuspecting eye. Located amongst specialty herb stores, leather makers and fresh orange juice vendors, Dar Essalam is marked only by a small placard that means almost nothing to outsiders. During the day, shadows cast by the makeshift straw roofing across the path through to Jemaa El Fna or “the big square” as the locals tell us, keep its presence relatively low key. Tipped off by the internet and a few friends, we paid a visit to the historic restaurant and were very literally led into another world. 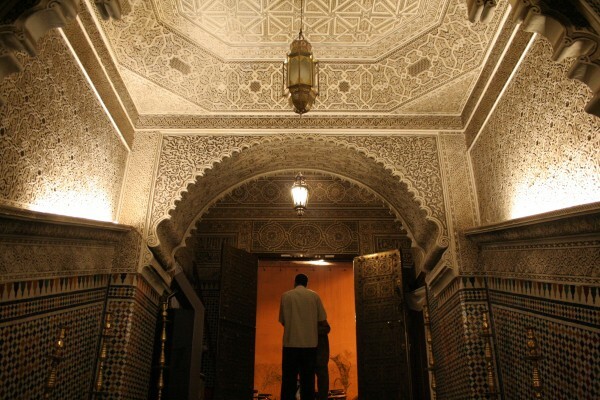 Stepping down the shallow stairs and into the underground entrance of the restaurant, we were shown through dimly lit hallways and room after room of gorgeous, intricately designed floor to ceiling structures that made us short of breath. I’m very serious. The smell of lemons and cinnamon wafted through the passageway, making us prematurely salivate. 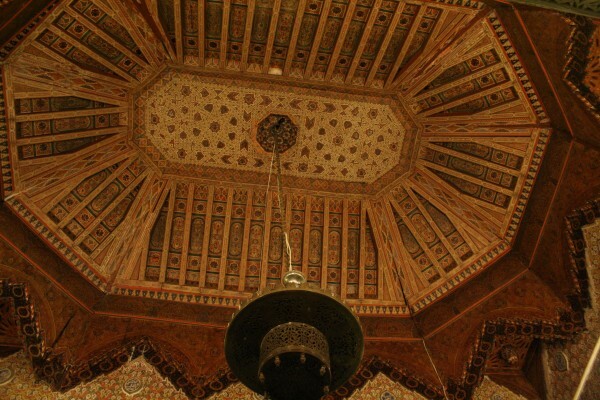 As we continued our walk forwards, the rhythmic sounds of a live Berber band seemed to welcome us into the grand hall. We walked across the checkered tiles through the center of the dining room and tried to take it all in at once. People sat around round tables on either side of us talking, laughing and eating while we we headed towards the back end of the restaurant where we had a private room all to ourselves. The room we dined in is the same as the one featured in Alfred Hitchcock’s “The Man Who Knew Too Much”. 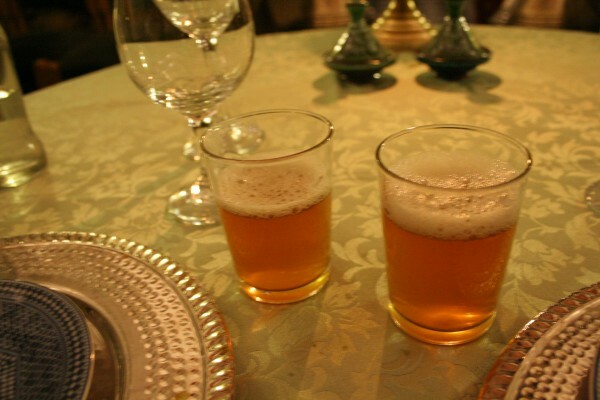 Dar Essalam offers alcoholic beverages – a surprise to us, given that it was one of the very few we had come across during our entire stay in Morocco. Then again, it caters to a good deal of tourists, so it makes sense. We indulged in a beer and a G&T and with that, the evening began. We opted for the set menu in order to get a more well rounded experience. 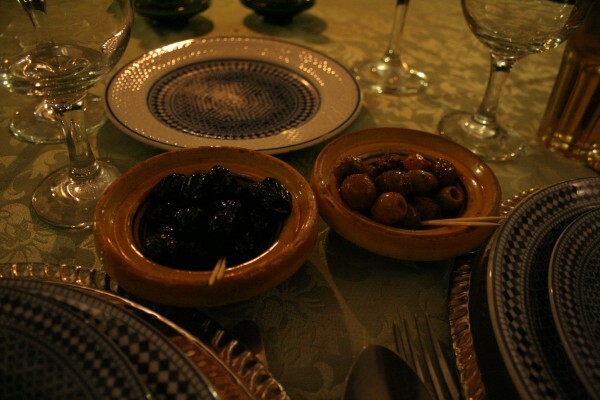 As soon as we put in our order, two plates of olives appeared at the table. Soon after, the briouates arrived. Freshly baked flaky pastries in the shapes of triangles, squares and cylinders stuffed with chicken and lamb, dusted with a light layer of powdered sugar. 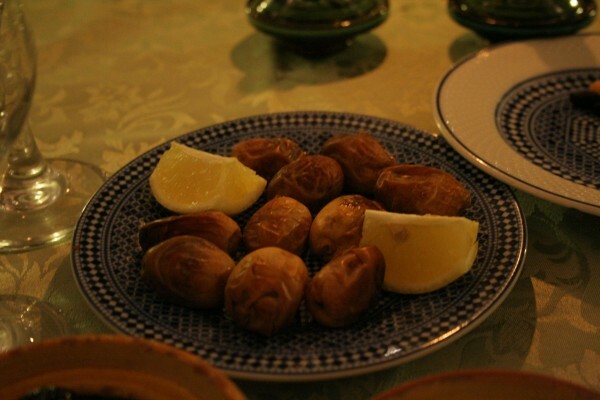 They were slightly sweet, typical Moroccan style. 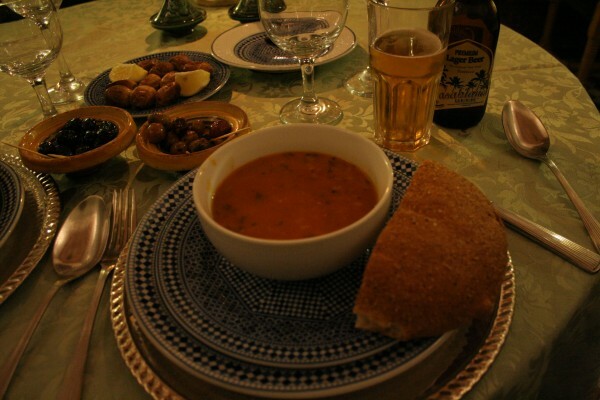 Our server helped dole us out a bowl of harira soup, composed mostly of tomatoes, lentils chickpeas which was really nicely spiced. A very typical dish done well. The soup also came with a big plate of dates. A little sweetness to everything! Just as we were finishing up our starters, the music stopped and from the front of the house, a woman dressed in blue veils and loose harem pants made an entrance. 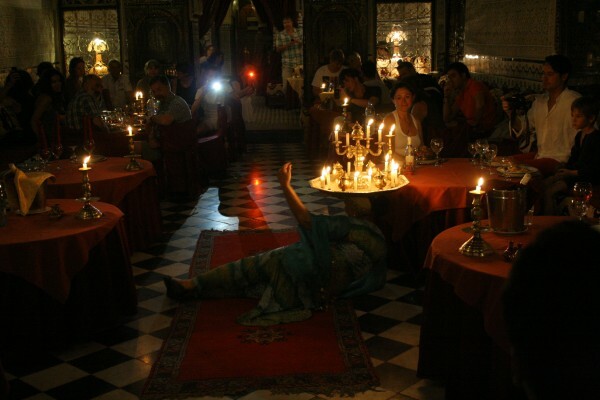 She had a silver platter balanced on her head, stacked with lit candles and a candle holder while she danced around the restaurant and performed some notable floor work. Impressive to say the least, given that the silverware looked like I would have had trouble picking it up with two hands. As she took her final bow for the evening, the music faded for a few minutes, giving us a little break to get back to eating and talking about the performance. 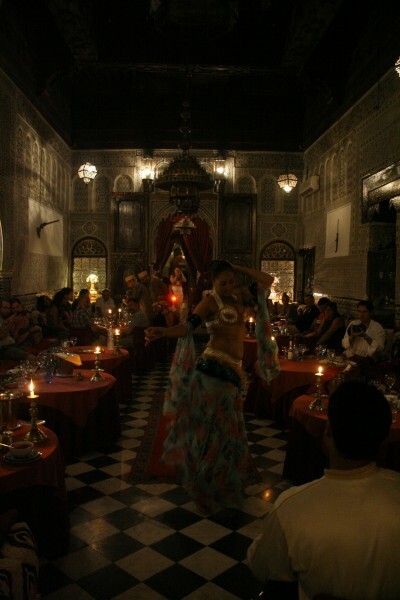 Just as we started to get comfortable, the music started again and this time, a belly dancer sashayed into the room, all smiles and sequins. Watching her dance was an experience in and of itself. You might notice that the entertainment is geared more towards tourists, as mentioned before. I say there’s nothing wrong with that. If you’re visiting Morocco for the first time, I think this is something you’d probably appreciate. In a setting so unique and beautiful, how could you not? 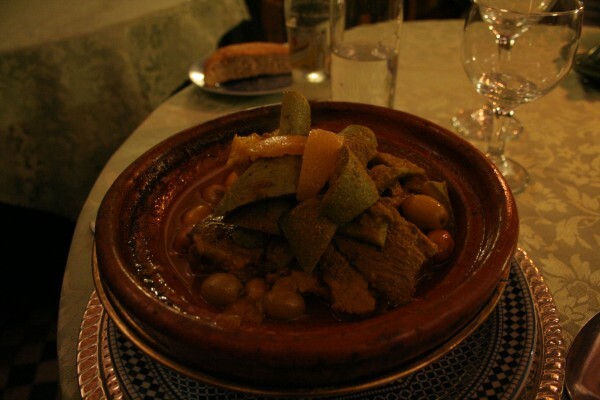 We had the chicken tagine with lemon and olives and the beef tagine with vegetables. Both deceptively simple dishes with really great flavor. 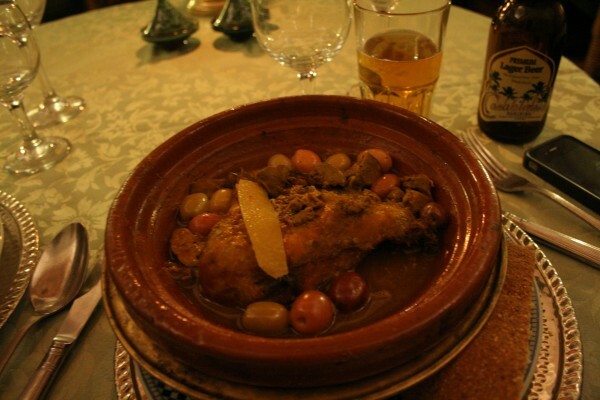 Both meats were juicy and tender, thanks to the special clay cookware used to make tagine. Nothing better than a classic done right. 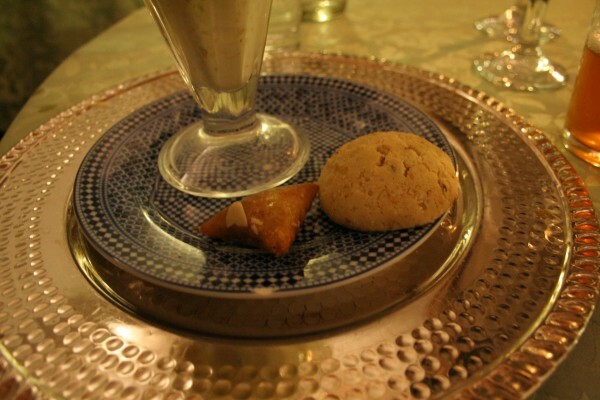 For dessert, we chose the almond pastilla and the rice pudding. 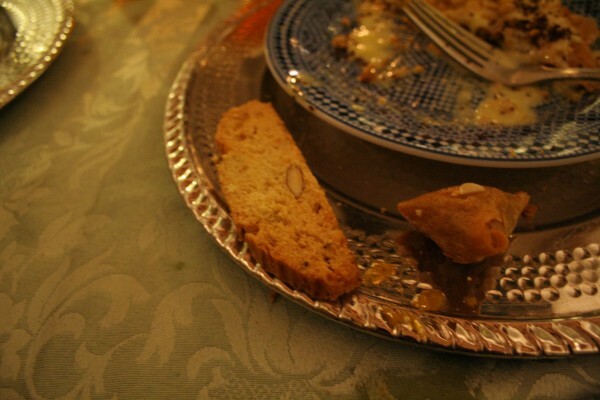 The almond pastilla was our favourite. 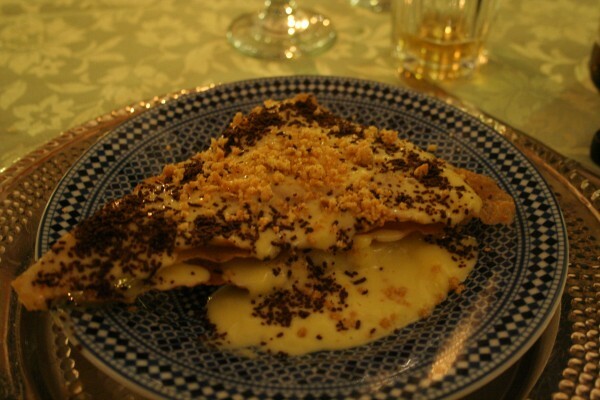 The triangular, flaky pastry was drizzled with cream, cinnamon and crushed almonds, proving to be a nice, light way to end the meal. 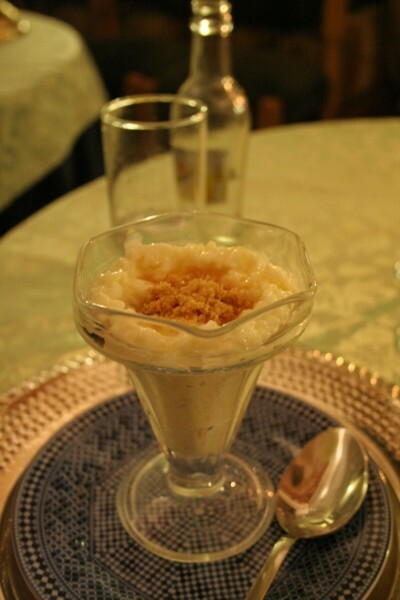 The rice pudding was much heavier in comparison and its taste was quite standard. 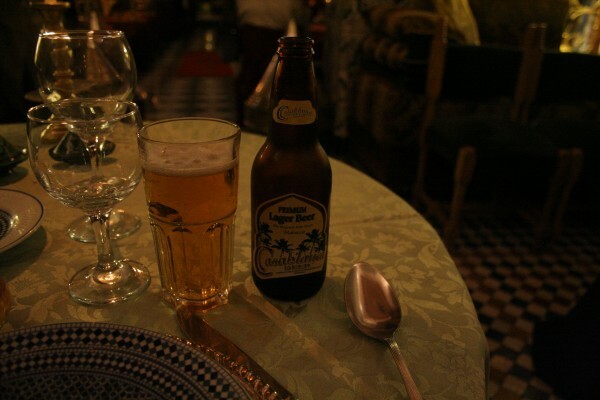 And of course, no Moroccan meal is complete without mint tea. 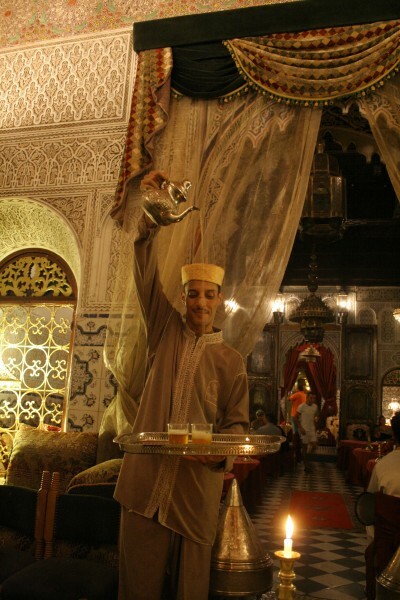 Our server expertly poured the tea for us, stretching his arm up above his head and aiming the spout of the teapot precisely so that the tea dropped straight into a tiny cup held in his other hand, stretched at and below his waist for maximum length. The tea was moderately sweet and very minty, just how i like it. 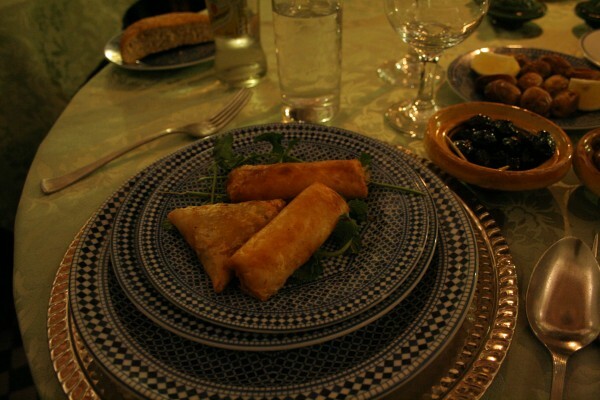 Our meal at Dar Essalam is one of the most memorable ones I’ve had to date. I still can’t believe the architecture of the place. Completely stunning. It’s worth it to visit and see the place alone. Tags: Alfred Hitchcock, Belly Dancing, Dar Essalam, Dinner, Marrakech, Morocco, Palace, The Man Who Knew Too Much.